Colombo: FC HTTU Coach Rowshen Meredov was bursting with pride as he praised his AFC President’s Cup winning side for their best performance of the tournament in defeating Rimyongsu Club of DPR Korea 2-1 in Friday’s final. Goals either side of half-time from Akmyrat Jumanazarov and Suleyman Muhadov had given the Turkmen club a shock 2-0 lead against a Rimyongsu side that had not conceded a goal in the tournament, let alone gone behind in a game. And even though Ri Kwang-hyok did eventually reduce the deficit on 86 minutes, FC HTTU were able to see out the remaining time to claim the title, and spark wild celebrations on the pitch and in the dugout. “I am so proud of my team, I call them my friends, my brothers; not my players,” said coach Meredov, who successfully ensured the AFC President’s Cup remains in Turkmenistan after fellow Yokary Liga side Balkan FT claimed the title in 2013. “The team showed their real performance today. We didn’t play like this in the group stages, we didn’t show our real ability. But today this was the real FC HTTU. Rimyongsu coach Jo Tong-sop, meanwhile, conceded that his players were not mentally prepared for the final despite cruising through the group stage with a 5-0 drubbing over FC Erchim in their Group B opener on Monday, before Wednesday’s comfortable 4-0 win against Sheikh Russel Krira Chakra Limited had secured them a place in the final. “The players were very nervous ahead of the game today and as a result weren’t able to play their best. Unfortunately, we did not properly apply everything we had worked on in training in the final,” said the former DPR Korea national team coach, who claimed that the absence of two key players was an obstacle the side could not surmount. “The match today was definitely a step up in terms of difficulty compared the group stages, but we had expected that to be the case. “What we struggled with more was that we didn’t have Jang Kwang-hyok as a result of injury and Ri Sang-chol due to suspension – they are big players for us. Colombo: Suleyman Muhadov claimed a hat-trick worth remembering on Friday as he scooped up the Abdullah Al Dabal MVP and AFC President’s Cup Top Goalscorer awards following FC HTTU’s victory over Rimyongsu Club of DPR Korea in the AFC President’s Cup final on Friday. The 20-year-old striker scored what turned out to be the winning goal in the 2-1 triumph for the Turkmen club at Sugathadasa Stadium and in doing so took his tally to a hugely impressive six goals in the competition from just three games. Muhadov had netted all three goals in his side’s 3-1 win over Manang Marshyangdi of Nepal in the Group A opener on Monday before hitting a brace on Wednesday in FC HTTU’s 2-1 comeback win over hosts Sri Lanka Air Force SC which secured them their place in the final. The son of former Turkmenistan forward Charyar Muhadov, the youngster was especially delighted at claiming the MVP award, as he walks in familiar footsteps. “I am always competing with my father and he often jokes with me saying that I’ll never be better than him,” said Muhadov. “But now I have all these trophies to show him! It was my objective to be top scorer in the tournament but I didn’t expect to earn the MVP award too – it’s really like a dream come true for me. However, as FC HTTU coach Rowshen Meredov pointed out, Muhadov’s dream almost became a nightmare as he was close to being ruled out of the final with injury. “Yes, Muhadov was a fitness concern ahead of the final today and early on in the match he actually pulled up with a problem, too, and I was seriously considering substituting him in the first half,” said Meredov. “But I believed in him, he’s a special player, so I kept him on the field and he scored a goal – just as he has in every stage of this competition. Ri Jin-hyok of Rimyongsu claimed runner-up spot on the scorers’ charts with three goals, while team-mates Ri Kwang-hyok, and Pak Song-chol, who also claimed the fair play award, and Kavindu Ishan of Sri Lanka Air Force joint on two goals rounded off the top five. Colombo: Akmyrat Jumanazarov and Suleyman Muhadov scored as Turkmenistan’s FC HTTU claimed victory in the last-ever AFC President’s Cup after their 2-1 victory over Rimyongsu Club of DPR Korea in Friday’s final at Sugathadasa Stadium. Jumanazrov’s 36th minute header had given FC HTTU the lead as Rowshen Meredov’s side looked to keep the title in Turkmenistan after countrymen Balkan FT had won last year’s edition of the tournament. Despite Rimyongsu pressing for an equaliser they were hit on the counter in the 54th minute by Muhadov who notched his tournament-leading sixth goal in just three games. And although the DPR Korea side pulled a late goal back on 86 minutes through defender Ri Kwang-hok to give them a sliver of hope, FC HTTU were able to hold on for a historic victory. FC HTTU had begun the championship climax with a trio of fresh faces with Gurbangeldi Batyrov, Azat Shamyradov and Jumanazarov returning to the side after their absence from the starting eleven in Wednesday’s Group A decider against hosts Sri Lanka Airforce SC. Rimyongsu, meanwhile, brought in Kang Won-myong for the suspended Ri Sang-chol and joining him was forward Kim Kyong-il with Jang Kwang-hyok making way. The DPR Korean club had boasted a flawless record in the group stage, in which they scored nine without conceding to top Group B, but it was FC HTTU who looked intent on imposing themselves on the game from the start and on six minutes Batyrov’s in-swinging free-kick from the right-hand side required an alert stop from Rimyongsu goalkeeper Ju Kwang-min. And there was more penalty area drama 10 minutes later after, as both Ro Hak-su and Hang Song-hyok failed to deal with Batyrov’s cross and the defenders were fortunate that the normally clinical Muhadov was unable to capitalise when the ball fell to him six yards out. Rimyongsu captain Pak Song-chol did then give a reminder of his threat from set-pieces with a free-kick from the left-side of the penalty area that almost caught out FC HTTU custodian Nurgeldy Astanov who belatedly fisted clear. But with nine minutes of the half remaining, FC HTTU broke the deadlock with a textbook training ground set-piece after Ri Chang-ho needlessly conceded a corner with a wayward backward header. From the resulting dead-ball, Batyrov played the ball down the line to an on-rushing David Sarkisov whose whipped-in cross fizzed menacingly into the penalty area where it was met by a fine arching header from Jumanazarov that arrowed into the bottom left-hand corner. After the half-time interval, Ri Hyok went close to drawing Rimyongsu level with a shot as he fell on the edge of penalty area but Astanov was able to get down low to his right and clutch the ball as it threatened to bobble past him. But with the DPR Korean side intent on attack, they were caught on the counter on 54 minutes as Shamyradov motored down the right flank before zipping in an inviting low cross that bypassed the Rimyongsu defenders and landed at the feet of the on-rushing Muhadov who lifted his shot over the flying Ju and into the bottom right-hand corner. Just after the hour-mark, Ri Chol-myong then went close to reducing the deficit with a brave header after he challenged Astanov for a high ball, but his headed effort wafted narrowly wide. And with just four minutes of the tie remaining, Ri Kwang-hyok ensured a frenetic finish as he stabbed home from close-range after a capitalising on a misdirected header by FC HTTU defender Shohrat Soyunov. However, FC HTTU were able to keep their composure and claim the title their performance had largely deserved, as the final whistle blew to the shrieks of delight from the Turkmen players with an emotional and jubilant Meredov dropping to his knees in celebration. Colombo: FC HTTU coach Rowshen Meredov is determined to emerge victorious in Friday’s AFC President Cup final over Rimyongsu Club and end the series of defeats suffered by the Turkmen against DPR Korean sides in AFC championship deciders. 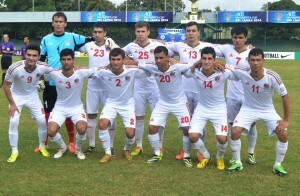 In both the 2010 and 2012 AFC Challenge Cup finals, the Turkmenistan national team came within minutes of victory against DPR Korea at the tournament’s climax, but a penalty shootout and a goal three minutes from time twice denied Meredov’s nation a place in the AFC Asian Cup. And despite having claimed top spot in Group A to advance to the 2014 AFC President’s Cup final with consecutive victories over Nepal’s Manang Marshyangdi Club and hosts Sri Lanka Air Force SC, the hoodoo the Koreans hold over the Turkmen is one that still weighs heavy on the FC HTTU coach’s mind. “Yes, we have some football history between our two nations, and I hope that this third time we face each other we can break this pattern of defeats, because our aim is to win this cup not just play in the final,” said coach Meredov (pictured), who had seen his side share a 1-1 draw with Rimyongsu in the final stage qualifiers in the Philippines in May. “The match we played each other before was very tough and we both had chances in that game, so I’m expecting another difficult contest with Rimyongsu. “We are also struggling with several injuries, we have a least five first-choice players with injuries. My medical staff is working hard and two of those players may be fit in time, but we’re still not sure. We’ll have to see on match day. Rimyongsu coach Jo Tong-sop, meanwhile, will find himself in familiar surrounds on Friday, as it was from the same dugout at Colombo’s Sugathadasa Stadium that he helmed DPR Korea to their historic 2010 AFC Challenge Cup victory over Turkmenistan. Adding to the sense of déjà vu is the presence in the Rimyongsu ranks of Ju Kwang-min, Pak Song-chol, Ri Chol-myong and Ri Kwang-hyok who were members of DPR Korea’s squad in the 2010 final, and former national team coach Jo is relishing the return to the scene of their triumph. “Our progress in this tournament has been quite similar to the 2010 AFC Challenge Cup as we also drew 1-1 with Turkmenistan in the group stages in that tournament before facing them in the final which we won,” said coach Jo, who saw his Rimyongsu side comfortably top Group B to reach the last-ever AFC President’s Cup final after they followed up Monday’s 5-0 drubbing of Mongolian champions FC Erchim with a 4-0 victory against Sheikh Russel Krira Chakra Limited of Bangladesh on Wednesday. “We were given a lot more confidence ahead of the final against FC HTTU as a result of our two comfortable victories over Erchim and Sheikh Russel, this really helped to boost the morale and belief of the players. Posted in Senza categoria and tagged rimyongsu, president's cup on settembre 25, 2014 by calciocorea. The Grand Finals Of AFC Presdents Cup Today At Sugathadasa Stadium.. The AFC Presidents cup has reached its finals of the final episode of the tournament and the winner will take home the prestigious AFC PRESIDENTS CUP home. FC HITTU of Turkmenistan who only needed a draw to advance for finals manged to beat Sri Lanka Air Force in thriller by 2 goals to 1 to reach the targets and will meet much fancied North Korean Club Rimyongsu Club.in the finals. The finals will kick off at 4.00 pm at the Sugathadasa Stadium on Friday 26th September which will be followed up by the Awards ceremony. 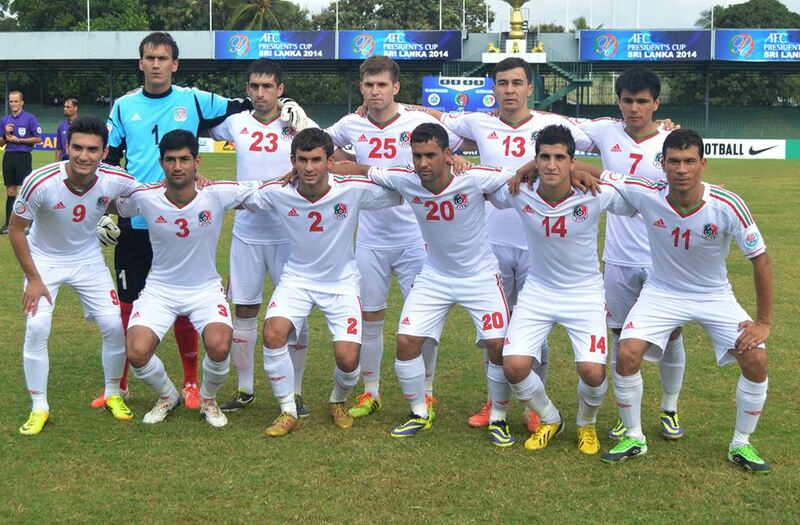 In the first Semi finals Rimyousy Club North Korea beat Sheikh Russels Krira of Bangladeah by 4 goals to 0. North Korean team plays a well combine and technical football which will be a challenge or the HTTU team. The HITTU club of Turkministhan had a tough game against hosts Sri Lankan Air Force and beat them 2-1 at the final whistle. It was Air Force who scored in the first 21st minute through their main stricker Kavindu Ishan to have the lead 1-0 at lemons. They led the HTTU till 80th minute and let the game turned towards HITTU win with 2 goals coming from their main sticker Sulayman Muhadev . He scored a hatrick at the opening game against Nepalese Manang to make his goals tally to 5. The fast and strong HITU played a good game with out luck and Sri Lankan goal keeper Sujan Perera excelled in between the posts to save 3 – 4 certain goal scoring chances . 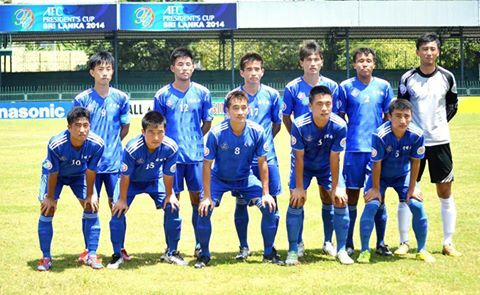 AFC President’s Cup: Rimyongsu in finale! Grazie ad un’altra gara di personalità il Rimyongsu vola in finale nell’AFC President’s Cup. Il Sheikc Russel è domato con 4 reti in una gara a senso unico. Posted in Senza categoria and tagged rimyongsu, president's cup on settembre 24, 2014 by calciocorea. AFC President’s Cup: buonissima la prima! E’ un super Rimyongsu quello che ha esordito nella prima gara del gironcino finale dell’AFC President’s Cup, che si sta giocando a Colombo nello Sri Lanka. Grazie ad una grande prova i coreani battono per 5-0 i mongoli dell’Erchim e si apprestano a giocare l’ultima gara con due risultati su tre: basterà non perdere contro il Sheikh Russel (vincitore solo 1-0 contro l’Erchim) per qualificarsi alla finale. Reti: 20′ Ri Jin-Hyok, 22’Ri Hyok, 24’Ri Kwang-Hyok, 57′ Pak Song-Chol, 65′ Ri Jin Hyok. Ammoniti: Ri Sang-Chol e Kim Kyong-Il. Colombo: A brace from Ri Jin-hyok saw Rimyongsu Club put the AFC President’s Cup on notice with a comprehensive 5-0 drubbing of FC Erchim in their Group B tie at Sugathadasa Stadium on Monday. Ri Hyok, Ri Kwang-hyok and Pak Song-chol were also on target to claim a convincing victory for the DPR Korea side while Erchim saw both Erkhembayar Batmunkh and Bilguun Ganbold sent off to cap a dismal afternoon for the Mongolians. With Erchim having already lost to Bangaldesh’s Sheikh Russel Krira Chakra Limited in their tournament opener on Saturday, their second consecutive defeat means they are eliminated from the competition, while Rimyongsu will take on Sheikh Russel on Wednesday to decide who advances to Friday’s final to face the winners of Group A. “The first match of any tournament is always the most important so we made a lot of preparation and focused all our efforts on this game,” said Rimyongsu coach Jo Tong-sop. “We prepared strategically, technically and psychologically and I’m very satisfied with my players’ performance, they really applied all our preparation in training to this match, which was great to see. Erchim coach Vojislav Bralusic had made two changes to the team that lost 1-0 to Sheikh Russel two days previous with Battulga Zorigt and Batbilguun Ganbaatar coming in to bolster the midfield, but it was Rimyongsu who looked the brighter side right from the start. Erchim goalkeeper Ariunbold Batsaikhan had to be at his best to keep out efforts from both Ri Jin-hyok and Ri Sang-chol early on before the rampant DPR Korea side, almost inevitably, took the lead on 19 minutes. Ro Hak-su’s in-swinging corner kick from the right-hand side found a leaping Ri Jin-hyok at the near post and the forward cleverly directed his head past Batsaikhan. And Rimyongsu’s lead was doubled just two minutes later as Ri Chol-myong found Ri Hyok unmarked in the penalty area with a lofted pass from near the centre circle, and the latter calmly controlled the high ball before steering a composed left-footed shot into the bottom left-hand corner. The quick one-two punch was a visible body-blow to a game Erchim side, who had worked a brave rearguard action throughout, and midway through the first half the score line became 3-0 as another accurate Ro corner was turned in, this time by Ri Kwang-hyok who ghosted in to head home. And Rimyongsu’s deadly precision from set-pieces continued in the second period as Pak curled in a splendid free-kick from the edge of the area nine minutes after the restart for his team’s fourth goal. Having been booked after conceding the foul that led to Pak’s goal, Batmunkh’s day got even worse just four minutes later as his foul on Ri Jin-hyok earned him his second yellow card and dismissal on 58 minutes. Despite Erchim now playing with ten men, Ri Jin-hyok was in no mood for clemency and on the 65th minute the striker had his second and Rimyongu’s fifth, as he clinically dispatched Ri Chang-ho’s knock-down from close-range. With Rimyongsu content to see out the remaining minutes there was still time for more misery for Erchim as Bilguun Ganbold saw straight red on 87 minutes for kicking out at Kim Kyong-il as the Mongolian side finished the tie with nine men. “Before the tournament I said Rimyongsu would be the strongest team in the tournament, and they showed that today,” said Erchim coach Bralusic. “They had better technique, power, and stamina than my guys, but I feel we learnt a lot from this game and it was a good experience for my players who are, after all, in an amateur team. Posted in Senza categoria and tagged rimyongsu, president's cup on settembre 22, 2014 by calciocorea. Afc President’s Cup dal 21 settembre! and altogether 6 teams will play for the championship in 2 groups. The group champions will play in the finals. The group stage was held in Colombo in May and as a request of the FFSL President Mr. Ranjith Rodrigo the finals will be staged in Sri Lanka giving an opportunity for local fans to see some exciting international club championship. The following teams have qualified and the matches will kick off at 1.00pm the first match and at 4.00 pm the second match at Sugathadasa Stadium Colombo. Posted in Senza categoria and tagged rimyongsu, president's cup on settembre 16, 2014 by calciocorea.